Prior to the release of the Dragon’s Dogma demo, the new IP from Capcom had somehow managed to fly under my radar. As it turns out, this was a poor error in judgment on my part as upon playing the demo I walked away being more than a little intrigued and quite a bit impressed. Now available for download on PSN and Xbox Live, the Dragon’s Dogma demo offers a quick play in the form of two sample adventures and allows you to pre-make your character and main Pawn in preparation for the retail launch on May the 22nd. The first of the two quests takes place inside a ruined area with goblins and offers you the standard “here’s how to play” quest. You’re given a sword and board hero to play as and three Pawn companions to help on your little adventure. Combat feels fluid and carries impact as you slash your way through the environment. Bashing your shield across a skull or two has a satisfying “thunk” and you’re free to follow up with a swift sword combo. The relatively few goblins and harpies in this sample do not offer much of a challenge as your band of heroes works well as a team despite being AI controlled. The shining selling point, and the thing that sold me most on the game as a whole, was the “boss” fight at the end of the first quest. You and your merry band face off against a fairly massive and very ferocious Chimera. This fearsome mythological nightmare’s three heads have their own attack types. The lion charges hard, swiping and biting the heroes. The serpent’s head for a tail uses poisonous strikes while the goat casts harmful spells on your group or helpful spells on its host’s body. During this frantic encounter, your companions will act as a group yet independently of one another. Your spell caster will cast spells based on the need of the group. The archer lets arrows loose at a rate that would make Legolas jealous but the real kicker was when I noticed that the rogue of the team had actually climbed on the beast’s back and was hacking away at the goat’s head. This sort of detail was jarring and more than a little awesome. The battle was hard fought, I was required to come to the aid of our caster on two occasions as the beast was smart enough to target her first. When the day was won, this part of the demo was over and I felt invigorated by the hard won victory. The second quest of the demo was shorter than the first. Instead of taking place inside the confines of cavernous ruins, this epic fight took place in a lush field with a grand castle in the back ground. After dispatching some lowly goblins, a shadow passed overhead. Shortly after, an impressive Griffon decided that my little group looked like lunch. For this adventure, you’re given control over a dual dagger and bow wielding rogue type instead of the hardier knight of the previous encounter. The Griffon is smart enough to stay airborne as much as it can and your group is required to use arrows and magic to bring it down. The caster uses a spell on the group which lights your weapons ablaze, including your arrows. After a few well placed shots on a moving target, one that is randomly swooping down on team mates, the Griffon falls from the sky. On fire. At that point, your group can close in and take the fight to it on ground level. The beast doesn’t stay grounded for long so it’s important to get your licks in while you can before he goes airborne again. Despite the hit and run tactics, I found this fight to be a little easier than the Chimera battle although my caster did half to heal me twice as the monster seemed to hate me quite a bit for attacking it from behind. Overall, the demo sold me on the game. The music was appropriately fantasy inspired, the visuals were nice, but the voice acting of your band of heroes might get a little old after awhile. Hopefully that will be something which can be adjusted in the options of the retail version. The most important selling factor was that it was fun. 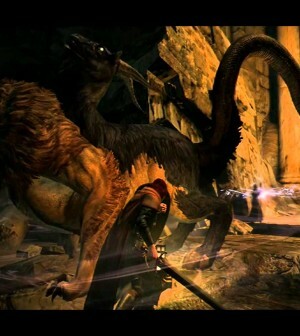 Dragon’s Dogma is some kind of weird Dark Souls slash Monster Hunter hybrid with an interesting “multiplayer” aspect in the form of those Pawns that you create. If you haven’t checked out the demo yet, I highly recommend you do so. There is a lot here to enjoy. Crisis 2 becomes a crisis?